Today is Easter Sunday, the most important day in the Christian calendar, but like most Britons we spent the day searching for chocolate eggs! 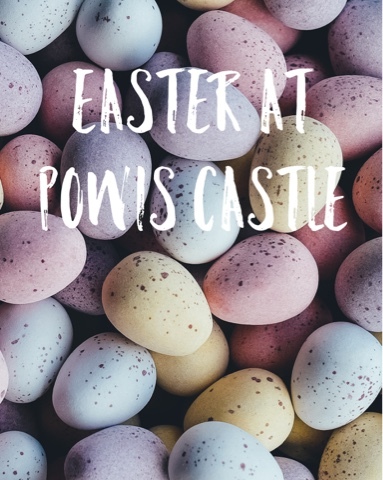 We decided to go to Powis Castle and Gardens, a national trust property and estate on the outskirts of Welshpool just over the border in Powys, Wales, to join in with their Easter Egg Hunt around their gardens. Not sure what to eggs-pect, me, Nikki and our little boy met up with some friends and their children in the packed car park just after lunch time to set off on our egg-citing adventure. For £2, we were given a clipboard, answer sheet, pencil and map to help us find the 9 eggs that had been scattered around the tiered gardens. Although our son wanted to walked the whole way round, we took his pushchair with us just in case, this resulted in taking the suggested route on the map which was designed for those wanting to avoid steps. The eggs we were looking for turned out to be A4 laminated sheets showing an egg which displayed an animal. This animal was then cross referenced against a chart with letters that made up an anagram which when solved gave the answer to allow you to claim your prize. We walked around the gardens at gentle pace but, despite the number of cars in the carpark, we never felt rushed in to moving on from one egg to another. This was really good, as it took our 2 year old a few minutes to recognise the animal and then find it on the reference sheet. Also, our friends children (aged 4 & 6) wanted to spend time noting the animals seen and the letter as part of the anagram. The children obviously wanted to get around all of the eggs as quickly as possible, but with all the wide open spaces, they could go running off playing as we meandered towards the next egg. We stopped in front of the orangery for a drink and snacks, which gave us an opportunity to take in the wonderful lawn and surrounding areas. Once we'd found the final eggs, we headed back to the entrance to claim the children's reward for finding all the eggs and working out the anagram. The hunt was really well organised and fun for everyone in our party in spite of the changeable weather. Hopefully we'll be able to head back to Powis Castle for some of their future events, as they are much more interesting than when I went to National Trust properties when I was younger.